Marlys Staley says she never identified as a “dog person” growing up. Her father worked for the U.S. Department of Agriculture mapping counties, so he’d bring home animals he would find. “I had a snake in my room for years,” Staley says. Snakes, cats and even a skunk at one point composed her collection of childhood pets, but never dogs. Yet years later — after graduating college, spending 18 years as a physical therapist specializing in burn and wound care, publishing books and traveling across the U.S. to speak and teach classes — she’s finally become a dog person. “I felt like I had accomplished everything I wanted to do,” Staley says of her former career in the medical field. So in 1997, Staley left her work behind and founded Circle Tail, a nonprofit that trains hearing and service dogs to partner with individuals in need. It also works as an adoption agency to find “forever homes” for retired dogs or for those unable to successfully complete their service training. The transition was natural, Staley says, as she’d come across guide dog facilities and had witnessed service dogs accompanying clients with physical disabilities throughout her career. Staley made it her personal mission to learn and then to teach others to do the same. 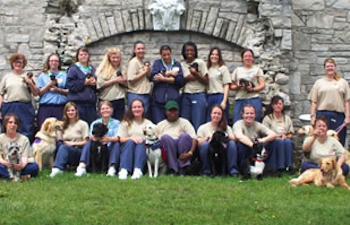 In a unique partnership, Staley set up service dog training programs for inmates at both the Ohio Reformatory for Women and the Dayton Correctional Institution. At DCI, the program “Dogs Can Inspire!” — a name crafted by an inmate who wanted to play off the acronym for the institution itself — incorporates 13 dogs from Circle Tail. Women in good standing must first participate in a training program, gaining 156 hours of knowledge and hands-on experience, prior to becoming a certified handler and receiving a dog of their own. And with that selflessness comes unconditional love from the dogs in return. Dogs rotate in and out of the program every four to six months, as they transition back and forth from the prisons to family foster homes and Circle Tail’s on-site kennel and training facility until they’re at least 1 1/2 years old — the age at which they’re ready to be placed with their partner. But despite the frequent changes, the handlers remain connected to their dogs. According to Staley, it’s all about fulfilling a sense of purpose. While handlers are fulfilled with a sense of purpose during training, post-training presents independence and a newfound sense of identity for clients who are successfully partnered with their new canine companion. Amy Hoh, whom is now on her second service dog from Circle Tail, has been confined to a wheelchair for nearly 17 years — a life-changing experience after having worked for the county 33 years prior. But when she was partnered with her first dog, Cortez, Hoh says she became visible again. “I became a human again,” she says. After the passing of Cortez, Hoh was partnered with Suela, a dog initially trained to support individuals with Post Traumatic Stress Disorder. Suela assists Hoh with everyday tasks like laundry — sorting clothes into piles of whites, darks and lights in addition to removing clothes from the dryer — but she’s also currently learning to detect Ketoacidosis, a precautionary measure for Hoh, whom is also diabetic. The capabilities the dogs possess make a world of difference in the lives and safety of those with whom they’re paired. Ganes, for example — a 4 1/2-year-old yellow lab — is partnered with 23-year-old Patrick McWilliams, who decided he could benefit from a dog trained to assist those with epilepsy. As Circle Tail Executive Director, Staley’s daily routine includes being followed around by Ali (sometimes referred to as “Tornado Ali”) and Tica — both of whom were once in the service training program but weren’t appropriate fits due to issues like hesitancy and even allergies — as she completes her work at the organization’s home base east of Loveland. Her new career continues to be fulfilling because sees the impact the dogs have in the lives of all parties involved.